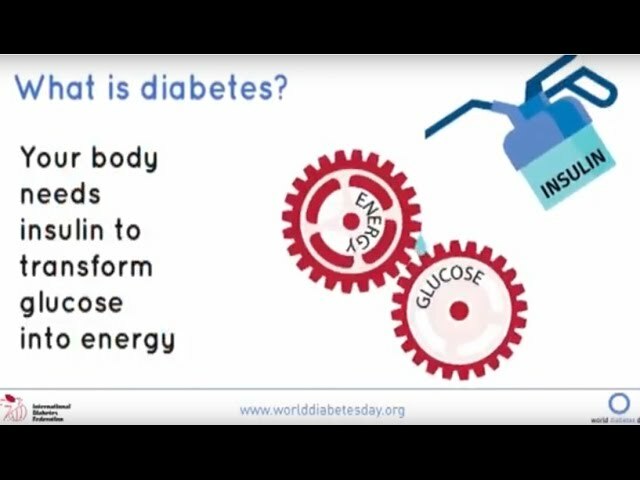 Insulin is a hormone made by the pancreas, that acts like a key to let glucose from the food we eat pass from the blood stream into the cells in the body to produce energy. All carbohydrate foods are broken down into glucose in the blood. Insulin helps glucose get into the cells. Not being able to produce insulin or use it effectively leads to raised glucose levels in the blood (known as hyperglycaemia). Over the long-term high glucose levels are associated with damage to the body and failure of various organs and tissues. There are three main types of diabetes – type 1, type 2 and gestational. Type 1 diabetes can develop at any age, but occurs most frequently in children and adolescents. When you have type 1 diabetes, your body produces very little or no insulin, which means that you need daily insulin injections to maintain blood glucose levels under control. Learn more. Type 2 diabetes is more common in adults and accounts for around 90% of all diabetes cases. When you have type 2 diabetes, your body does not make good use of the insulin that it produces. The cornerstone of type 2 diabetes treatment is healthy lifestyle, including increased physical activity and healthy diet. However, over time most people with type 2 diabetes will require oral drugs and/or insulin to keep their blood glucose levels under control. Learn more. Gestational diabetes (GDM) is a type of diabetes that consists of high blood glucose during pregnancy and is associated with complications to both mother and child. GDM usually disappears after pregnancy but women affected and their children are at increased risk of developing type 2 diabetes later in life. Learn more.